Latest updates from MSF's work in cities and towns across Libya. The medical situation in Tripoli is slowly improving, despite continuing shortages of electricity, water and fuel, which are crucial for households and medical facilities. Although hospitals are still stretched, they are now more capable of dealing with the backlog of patients. Shortages of medical personnel are being overcome as more and more medical staff return to their stations. Medical and non medical Libyan volunteers are also working to fill gaps where needed. Supplies of medicine and medical materials are getting replenished, but MSF teams that have visited and evaluated hospitals have seen that there are still shortages in specific medical supplies like external fixators, as well as medicine for the treatment of chronic diseases. On Thursday 1st September, an MSF surgical team started to work alongside local health personnel at the Ben Ashour clinic in central Tripoli, to operate on orthopedic cases (second line surgery). Migrants and refugees from sub-Saharan Africa continue to face deplorable living conditions and need access to basic essentials such as water and food. Hundreds are squatting in various informal settlements around the city, fearing harassment and arrest and unable to access proper medical care or security. MSF is currently carrying out medical consultations and distributing clean water in two different locations where approximately 1200 migrants are gathered. Since the 27th of August, around 350 consultations have taken place with a focus on women’s health and mental health support. MSF is providing surgical support in two Misrata hospitals. In Qasr Ahmed hospital, MSF is doing emergency surgery and trauma-related second line surgery. This hospital has two operating theatres (one of which was rehabilitated by MSF) and 151 surgical acts were performed in August. In Abbad hospital, MSF is providing surgical support on a case-by-case basis. In Qasr Ahmed hospital, MSF has treated wounded patients who were transferred from Tripoli and Bani Walid. 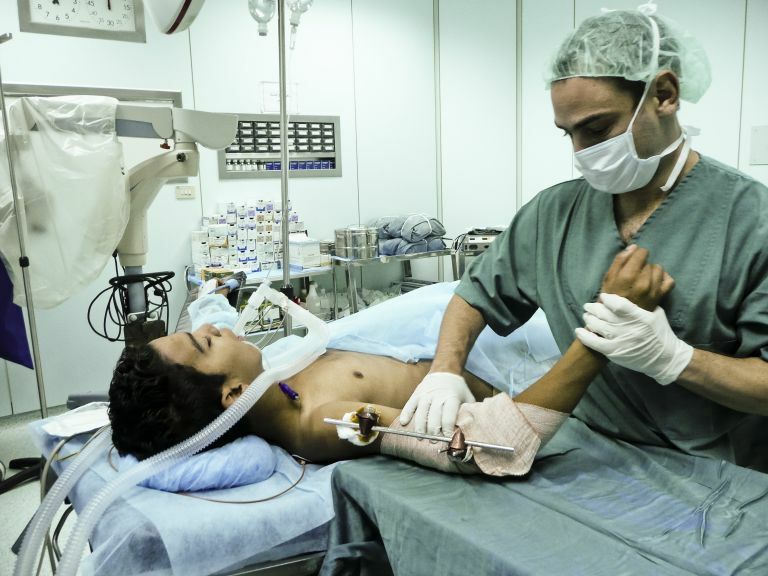 MSF is also providing post-operative care, including physiotherapy, for wounded patients who have undergone surgery. MSF has also set-up a surgical mobile unit ready to be dispatched to locations around Misrata where there is no capacity to provide urgent medical care or treat an influx of wounded patients. This unit is designed to stabilize wounded patients and perform life-saving surgery. MSF is running a mental health programme in the city, which includes activities in the community, in the hospitals, and the city’s military prison. MSF is also providing staff support, material support, and training in the Al Noor and Zliten Hospitals. In addition, MSF is providing medical and post-operative care for 50 prisoners in the military and civilian prisons who need to be followed up with on a daily basis. MSF is referring patients who need reconstructive surgery to an MSF run hospital in Amman, Jordan. So far eight people wounded during the conflict have been transferred to Amman for orthopaedic or maxillo-facial surgery. MSF is supporting the hospitals in Yefren and Zintan in Western Libya. MSF is providing staff, medical supplies and equipment to support the emergency room, the operating theatres and the post-operative care unit. Between July and August, MSF saw the numbers of wounded doubling, but the situation in and around Yefren is now calmer. In Zintan, MSF is providing psychological support in health centres to people affected by the violence.